"Canine Nose bleeding is usually a sign of another disorder. In most cases a bleeding dog nose is caused by a fungal infection or or cancer such as a canine nose tumor. It can also be caused by excessive sneezing, which will result in a temporary condition. It can also be caused by your dog's environment including pollution from smoking or poor air quality, an object in your dog's nose, a blood clot or bacterial infection." The most common cause of a bloody dog nose is a fungal infection or cancer. As mentioned it is just as likely that a temporary problem is due to sneezing. Other causes include bleeding due to an object lodged in the nose. If the dog nose bleeding is due to a tumor it is usually benign or not cancerous. It is rare for a canine nose tumor to become cancerous. Tumors are usually seen in dogs age 2 - 12 with 10 being the most common age. Nasal adenocarcinoma is the most common tumor type. A bleeding dog nose can also represent problems or bleeding in other parts of a dog's body. For example, bruising in other parts of a dog's body can be accompanied by a dog bleeding nose. Bleeding is also seen when there are problems in the area of the nose such as a tooth abscess. It is possible that bleeding starts on one side of the nose, such as from a dog nose infection, that then moves to the side of the nose that wasn't bleeding. of the dog nose, such as an abscess in the roots of the teeth. Many of the symptoms associated with canine nose bleeding occur before you actually see blood. Symptoms include sneezing and discharge from the nose. Discharge may contain blood. Your dog may have trouble breathing or snoring, a symptom that is consistent with something lodged in the nose. Your dog might be constantly reaching for the nose causing or due to irritation or inflammation and swelling. Tumors are suspected if blood is coming from only one nostril or there is discharge. 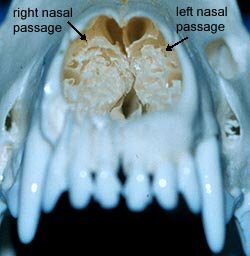 Other symptoms of canine nasal tumors are watery eyes, a swollen face, coughing, or some trouble breathing. It is difficult to diagnose nose bleeds. A blood test will be used to see if there are any obvious signs of a problem. If the test comes back normal, then it is assumed that the cause of the nose bleed is isolated to the nose. Your veterinarian might time the duration of the bleed and the time it takes to stop the bleeding. Veterinarians have a device called a rhinoscope (used in bigger dogs) where a video camera is fed through your dog's mouth into the nose. A biopsy is taken to test for cancer. Other approaches including taking a tissue biopsy, a CT scan (helpful to look at dog tooth roots) and using fluid to wash the nose. A dog blood test can reveal if infection is the cause of the dog nose bleed. X-rays can detect cancer by looking at bones and determining if they have worn away. If the nose bleed is accessibly, try applying pressure to the point of the bleed. A fungal infection of the nasal passages (nasal aspergillosis), in one or both nostrils, and may cause erosion around the nasal openings. Most dogs will respond to treatment by your veterinarian. The key is to catch it early as a bad infection could cause changes in the nasal passages that could lead to bacterial infections and chronic nasal discharge. If the nose bleed is due to toxins in the environment, it is usually due to the toxin reducing the vitamin K1. Replacement dosages of this vitamin can help. Canine nose tumor treatment is difficult. They are treated with surgery and radiation. Studies have shown that surgery alone is not effective with survival rates that are no different than dogs that have not been treated. Most dogs with canine nose tumors live more than a year after treatment.